JACKSONVILLE, FL--(Marketwired - Mar 24, 2014) - Country music fans looking to combine a getaway with good tunes will find the best of both worlds in Jacksonville. This summer, the city will host the Florida Country Superfest just 6 miles from the Jacksonville Marriott, where guests will enjoy a convenient location and great rates. On June 14th and 15th, the country music festival will take over EverBank Field near this Jacksonville hotel, bringing 2 days of music and fun for the entire family. Each day of the festival brings top headliners with a Saturday lineup of Jason Aldean, Eric Church, Little Big Town, Big & Rich and Colt Ford, and a Sunday lineup with Luke Bryan, Miranda Lambert, Florida Georgia Line, Easton Corbin and Joe Nichols. While musical acts are the main event, the Fan Fest & Tailgate Party is a favorite, too. Located just outside the EverBank Field, the event kicks off before the concerts and features artist meet-and-greets, musical performances, food and more. Guests staying at this EverBank Field hotel will enjoy the convenience of being so close to the event in addition to rates as low as $89 a night. 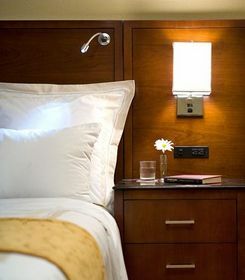 After a full day of excitement, they'll retreat to a comfortable room, where a plush bed, LCD TV and coffee/tea service await. Those who are still jumping with adrenaline can burn off some steam in the fitness center or indoor pool. Visitors craving something other than festival food will find two great options here including the Lobby Lounge, offering cocktails and signature Southside cuisine for lunch and dinner, and all-day dining at Bistro 202, serving a menu of modern American dishes. This hotel in Jacksonville, FL offers an affordable getaway with rates from just $89 a night and tickets for the festival starting as low as $35. For more information about the Florida Country Superfest, including a schedule and to buy tickets, visit www.floridacountrysuperfest.com. At the Jacksonville Marriott, visitors get the best the Sunshine State has to offer, from beautiful beaches and warm weather to friendly service and delicious dining. Offering an ideal location for vacation or business, this downtown Jacksonville hotel features a modern fitness center, indoor pool, sauna and whirlpool to help guests maintain their healthy lifestyle. Wellness isn't just about working out, and the hotel's two dining options offer variety that can accommodate most preferences. At the Lobby Lounge, lunch and dinner features a full menu of Southside cuisine plus creative cocktails. For all-day dining, try the modern American dishes at Bistro 202. Accommodations offer opportunities for both relaxation and focus with plush bedding, a 32-inch LCD TV, coffee/tea maker, spacious desk and high-speed Internet access. Nearby, explore shopping, dining and entertainment, or simply enjoy a day at the beach. As the only full-service Marriott in the city, the hotel is a top pick for meetings and events and offers 14,000 square feet of function space and a full range of services. Country music fans looking to combine a getaway with good tunes will find the best of both worlds in Jacksonville. This summer, the city will host the Florida Country Superfest just 6 miles from the Jacksonville Marriott, where guests will enjoy a convenient location and great rates.